Designed and built with little riders' needs at the very forefront of every detail, Frog bikes have got children's bikes down to perfection. They successfully see the cycling world through children's eyes. Each bike is ergonomically designed to allow children to concentrate on the skill of riding, without struggling with heavy frames, tough brakes or poor sizing, enabling them to progress quickly, and get more enjoyment from cycling. Frog pride themselves on being 'The lightweight kids bike' and they truly are. Can you imagine riding a bike that’s half your own body weight? That’s what lots of steel kids’ bikes are like. But a lightweight bike is easier for children to balance, control and enjoy, and faster to ride! It’s also easier for parents to carry or load onto a roof-rack. Frog Bikes are all aluminium, which makes them some of the very lightest bikes on the market. Whether its a toddler's first wobbly steps on a balance bike or an older child with a desire to do more serious cycling, Frog bikes have got it covered. There are two ways to order your Frog bike; call into the shop and we can order it for you, or order online at Frog and have it delivered to our store, where we will build and set it up for you. The website is very user friendly and makes the whole process very simple, from sizing, colour choice, to completing your order. Leapfrog is a fantastic part exchange scheme, which stops old bikes becoming unloved and dusty in the corner of your garage; and also makes progress up the Frog bike ladder very easy and economical. When your child outgrows their bike come and talk to us about part exchange plans to get the next sized bike you require. Frog recommend starting on a lightweight balance bike from a young age (2-3 years) as balance is so important in riding. Kids will enjoy the freedom of a set of wheels and the transition to a “proper” bike with pedals will be relatively smooth. Balance bikes can handle much rougher terrain than stabiliser wheels, as their wheels are so much bigger. If your child is too big for a balance bike, get them a lightweight bike which is the right height for them, and take off the pedals for a few weeks and use it like a balance bike. It won't take them long to get the hang of it, then add back the pedals and they'll be off! We are delighted to be a Frog bike stockist and they literally fly out of our shop. 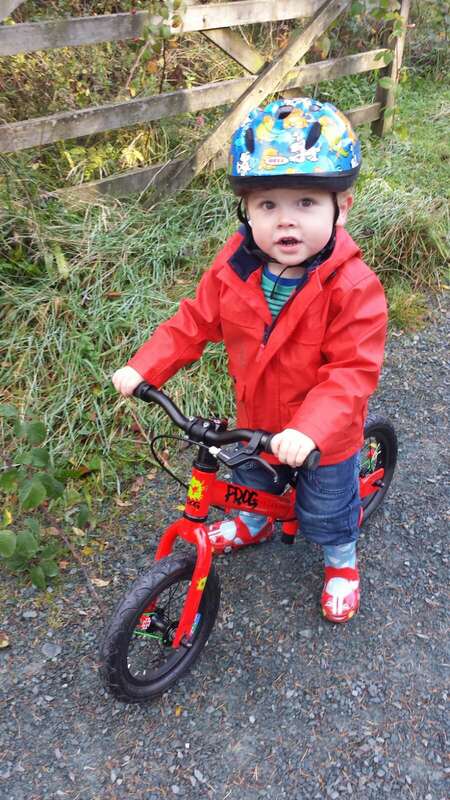 It's a brand we really believe in, and all our own children are starting their cycling journey on Frog bikes. See your own child's cycling off to a positive, fun and encouraging start on a Frog bike. This great value all-aluminium bike has very lightweight high quality frame and forks. Suitable for riders aged either 3-4 or 4-5 years old with a minimum inside leg of 43 or 48cm. Available in a range of colours, and Team Sky colours. The all-aluminium road / CX bike is available come in three sizes, 58, 67 and 70 and suitable for riders with a minimum inside leg from 58cm (around 6-7 years old) to 70cm (around 11-14 years old) again in a range of sizes, and colours. The perfect lightweight balance bike to get young children started on two wheels. Suitable for riders aged 2-3 years with a minimum inside leg of 31cm, available in a range of colours, and two sizes. View the full range of Frog Bikes and order into store here in Cockermouth at Frog Bikes.